Bluegrass Pundit: Why Did Former RNC Chairman Michael Steele Decide To Hold This Convention In Florida During Hurricane Season? Why Did Former RNC Chairman Michael Steele Decide To Hold This Convention In Florida During Hurricane Season? 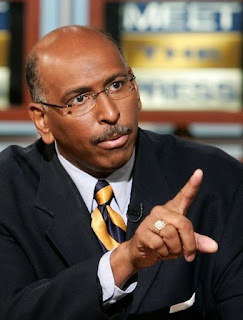 Michael Steele responds to that criticism. Former RNC Chairman Michael Steele lashed out Saturday night at Republicans grumbling over the party’s decision to hold the GOP convention in Florida at the height of hurricane season. With Tropical Storm Isaac forcing Republicans to cancel the first day of proceedings, some party operatives are privately pointing a finger at Steele, who helmed the GOP when the party settled on Tampa. Because he's a CLAIRVOYANT: he knew that protest groups like OCCUTARDS would be outside with their rabble, & thus would all need FREE SHOWERS.